In the early 2000s love padlocks began to appear in various locations around the world. 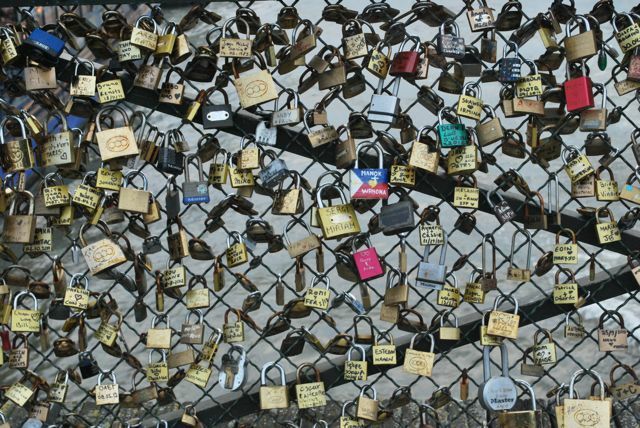 Couples would engrave, paint or even scratch their initials or names onto locks of various shapes and sizes, attach them to a site and then throw the keys away. 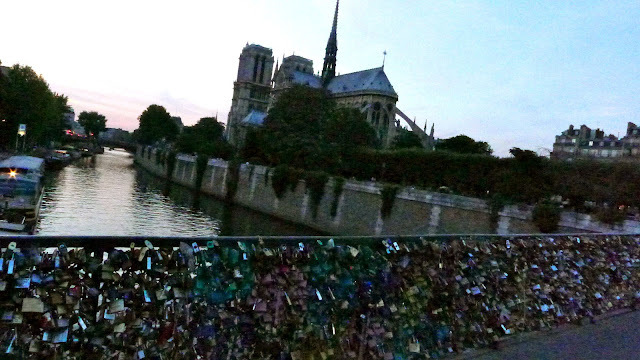 In Paris most of the keys are tossed into the River Seine ! How about this giant size version at the base of the bridge?! On the Pont des Arts, the pedestrian foot bridge near the Louvre in Paris, the phenomenon grew until one night in 2010 most of the locks mysteriously disappeared with the Town Hall authorities denying any involvement. However, in no time the locks were back and now include another bridge, the pretty Pont de l'Archeveche near the Notre Dame Cathedral. On my visit this September some artistic soul had even spray painted one side of the bridge in rainbow hues.